Martin O’Neill’s side are in 31st, three places behind Northern Ireland. 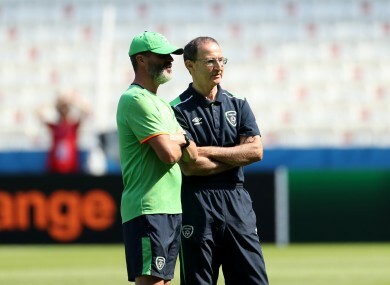 Roy Keane and Martin O'Neill. IRELAND HAVE MOVED up two spots in the Fifa world rankings on the back of their campaign at the European Championships. Martin O’Neill’s side are now ranked 31st in the world after they reached the Round of 16 in France, where they went down 2-1 to the hosts. Didier Deschamps’ charges were one of the biggest movers on the rankings, jumping 10 places to seventh. They sit one spot behind European champions Portugal, who moved up two spots to sixth. The first five in the rankings remain unchanged with Argentina at the summit, followed by Belgium, Colombia, Germany and Copa America champions Chile. Wales have surged up 15 spots to 11th following their surprise run to the semi-finals in France and now sit ahead of Uruguay (11th), England (13th, down two places) and Mexico (14th). Northern Ireland have dropped three places to 28th despite reaching the Round of 16 in France while Scotland are clinging on to the top 50 after falling seven spots. Some of the other big movers include Croatia (up 12 to 15th), Poland (up 11 to 16th), Iceland (up 12 to 22nd), Austria (down 11 to 21st), Netherlands (down 12 to 26th) and Ukraine (down 11 to 30th). Email “Ireland up two places in Fifa world rankings while Wales overtake England”. Feedback on “Ireland up two places in Fifa world rankings while Wales overtake England”.